Being a Marianapolis student can't be summed up in just one word. Scholars. Athletes. Musicians. Artists. Poets. Leaders. Our students are involved in activities across many disciplines and are constantly challenging themselves to set new goals and break molds. 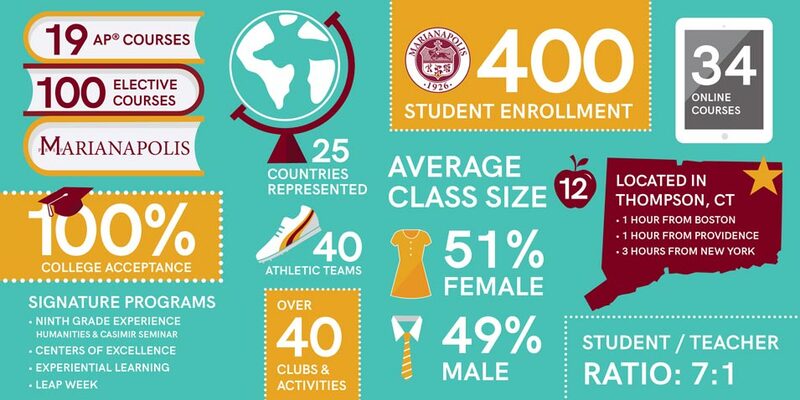 Marianapolis boasts a 7:1 student/teacher ratio with an average class size of 12. With numerous honors and AP courses and over 100 electives, students are cultivated to think critically while being guided into mature and capable leaders. At Marianapolis, learning does not stop when the academic day ends nor does it always come from a textbook. The opportunities for real-world learning are plentiful. Sure, learning about a marine ecosystem from a documentary might be interesting, but how about visiting a hospital for sea turtles in Georgia to see it up close? That's one of a multitude of unique experiential learning opportunities offered through LEAP Week. In addition, project and application-based learning is available through internships with our certificate program, Centers of Excellence. At Marianapolis, students are encouraged to explore their interests outside of the classroom. With over 40 clubs and organizations to choose from, there is something for everyone and if there isn't, students are welcome to create their own clubs. Club meeting time is built into the daily schedule so students are able to participate without worrying about conflicts. Students have 16 competitive athletic options to choose from, as well as numerous non-competitive options including a host of activities that appeal to a wide range of interests from dance, to equestrian, to photography, and martial arts. Depending on a student's skill levels and interests, Marianapolis has something for everyone. Here, students have the opportunity to experience learning beyond the classroom and outside of campus through the Experiential Learning program and LEAP Week. 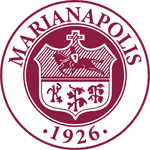 Marianapolis students come from all over the United States and the world, creating a unique and diverse residential community. Our nine houses and halls provide the feeling of a home away from home. Students are often found in common spaces playing a game of foosball or baking cookies. On weekends, students are able to participate in numerous activities from shopping trips, to cultural activities, to city excursions. A favorite tradition, the House Cup Challenge, sees houses and halls compete against one another in anything ranging from dodgeball to flag making. Wherever a student hails from in the world, Marianapolis feels like home.